When someone asks me to name the bees’ knees of quirky kids clothing, I sing the praises of Oishi-m. Truly individual and masters of their field, I first mentioned Oishi-m last year and now they’re all set to have both little boys and girls covered this winter in the funkiest of new designs. New Skinny fit and Chubba jeans, retro skirts, kimono hoodies and super comfy trackpants are set to deck out all little ones up to size two. 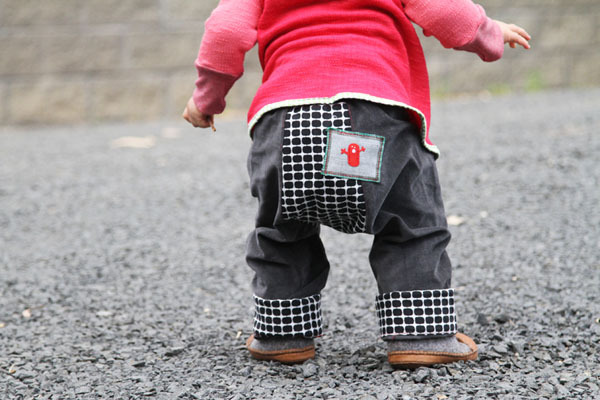 The Velveteeen Chubba pants are made from luxuriously soft velveteen and cuffed with the cutest prints. They also have Oishi-m’s clever tummy toastie waist band, making for one pair of super snug winter pants! I’m a little devastated my youngest is too big for Oishi-m sizing as the Baaaa long sleeve tee (pictured above) is a firm favourite, given my love of all things striped. Velveteeen Chubba pants are priced at $62.95 and the Baaaa long sleeve tee $39.95 from Oishi-m, with delivery to your door available!